The Coast Guard is an often overlooked service, but that does not diminish its importance. A Coast Guard Auxiliary flag is a perfect way to bring attention to the vital work that these services do. The Coast Guard Auxiliary was formed as a reserve component of the Coast Guard. It engages in all the services that the regular Coast Guard does except for direct law enforcement. The United States Coast Guard Auxiliary was established by Congress in 1939 to assist the Coast Guard in promoting boating safety. It boasts more than 36,600 members from all walks of life who receive special training so that they may be a functional part of Coast Guard Forces. Auxiliaries assist the Coast Guard in non-law enforcement programs such as public education, vessel safety checks, safety patrols, search and rescue, maritime security and environmental protection and Coast Guard Academy introduction programs for youth. Auxiliaries volunteer more than 2 million hours annually to benefit other boaters and their families. 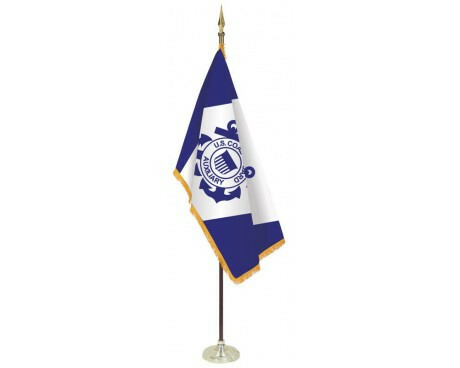 Buy a Coast Guard Or Auxiliary Flag Today! A Coast Guard Auxiliary flag from Gettysburg Flag Works is a high quality, made in America product. 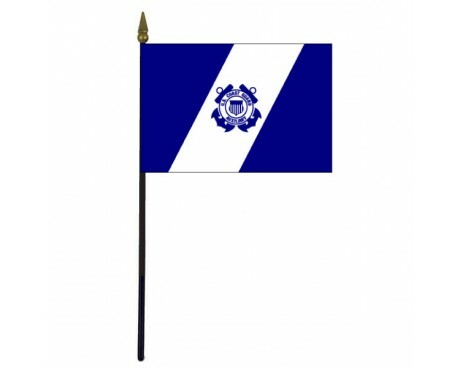 We offer our flags in colorful nylon for both indoor and outdoor use. If you want to fly your Coast Guard or Auxiliary flag outside, the colors on the nylon are resistant to fading so the colors will look great for a good long while. If an indoor display is what you’re after, our Coast Guard and Coast Guard Auxiliary flags are the same colorful nylon, but with gorgeous gold fringe around them. A Coast Guard or Auxiliary flag would make a great gift for someone in their service. If you were in the service, consider a gift for yourself! A Coast Guard or Coast Guard Auxiliary flag flying high and proud will ensure that no one forgets about this vital branch of the Armed Forces. If you are considering buying a Coast Guard or Coast Guard Auxiliary flag you may want to consider and American Flag. An American Flag will complete the display, showing the country that the Coast Guard is in service too. Customers who bought a Coast Guard Auxiliary flag, were also interested in military medallions.